This was basically a lasagna filled with Ricotta, pea puree of my making and some spices. It flowed together beautifully and the taste was a delight. I honestly thought Hubby would not like it but he certainly did. It makes for a light meal. I would serve it with salmon, next time. I enjoyed cooking this and more so, we enjoyed eating it. In a small saucepan over medium heat, cook frozen peas in 1/3 cup water until heated through. Remove from heat and set aside. Bring water to boil in medium sauce pan ---- cook lasagna noodles until al dente - firm, yet cooked through. Rinse well with cold water. Set aside. 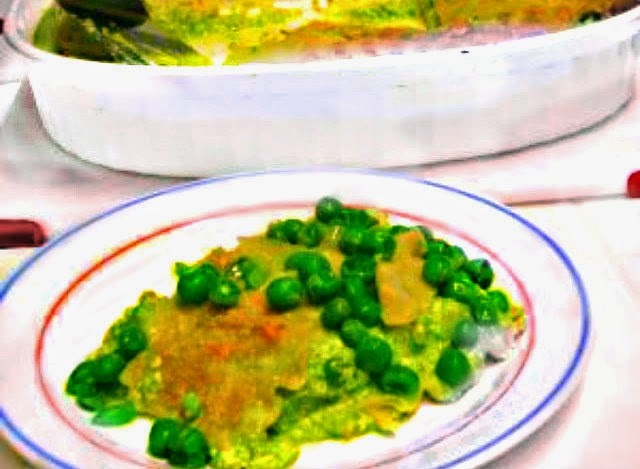 In a food processor or mini-food processor, combine the peas, their cooking water, and the onion, and the 1/2 teaspoon of thyme and blend to a puree. It should look like baby food. Grease a lasagna pan with enough oil to coat the bottom of the pan. Lay two sheets of pasta on the bottom of the pan the long way. Place 1/4 of the pea puree on each, then 2 ounces of ricotta on each, then salt and pepper (and thyme if you like). Cover this layer with another sheet of lasagna and repeat. Top with a third layer of pasta and place 1 tablespoon of butter, cut into pieces and evenly spaced around the noodle on top of each lasagna stack. Sprinkle parmigiano-reggiano over, and place in the oven on the middle rack. Bake for 30 minutes or until the lasagna is lightly browned and bubbling. Remove from oven and let stand for 5 minutes so that it doesn't fall apart while you cut it. Cut each stack in half and serve with the pea garnish described below. Add oil to pan so that the pan is evenly coated . Cook the onion until translucent, approximately 5 minutes. Add the peas to the pan and cook until heated through. Keep warm until lasagna is ready to serve. Top each lasagna with 1/4 of the pea mixture and sprinkle Parmesan on top of the mixture. Spray olive oil, lightly on top. What a fresh take on the usual heavy lasagna. Great idea, Chaya!